Every year the cyber threat landscape is different than the year before as new technologies replace the old and new means of digital disruption replace those that came before. 2018 was anything but quiet with an uptick in cyber activity from major geopolitical actors, and vulnerabilities and techniques weaponized faster than ever. 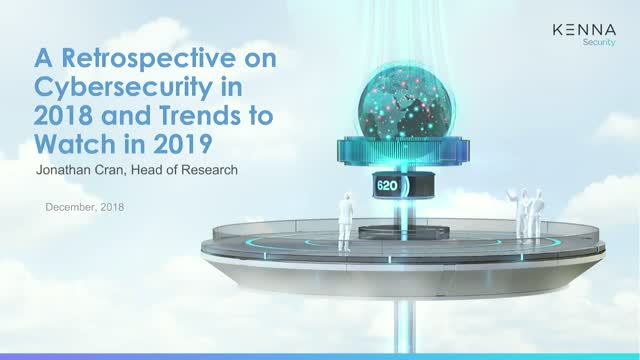 Despite fewer reported breaches in 2018, the cyber landscape continued to evolve rapidly. Take control of cyberthreats in 2019. Register now. As enterprises deepen their investment in public cloud and digital transformation, the rate of sensitive data flowing through their organizations continues to accelerate. This has left application security teams with many visibility and process challenges. Join industry veterans and application security experts Jonathan Cran, Head of Research at Kenna Security, and Tyler Shields, Vice President of Strategy and Business Development at Sonatype—as they provide insight into successful application security strategies, and tips that the best programs can use to get ahead. Why are some vulnerabilities exploited when so many aren’t? What are the characteristics of a vulnerability that make it more likely to be exploited than another? Join Michael Roytman, Chief Data Scientist at Kenna Security, and Jay Jacobs, Data Scientist from the Cyentia Institute, as they uncover the causes of vulnerability exploits. Listen in as they continue their discussion from RSA on vulnerabilities, and their conclusions from an in-depth review of many different data sources including tens of thousands of vulnerabilities, CVSS scores, CVE, NVD, and mailing lists and data feeds. We can predict the weather, but we still lack the necessary foresight into the cyber-attacks heading our way. And that can often put us in a place where we’re reacting to a threat after it has occurred. So, how do you know if your company is a target? What data do you need to understand to help keep your company secure? And how can your company data, threat models and industry data help evaluate risk? Application security is an increasingly important, yet commonly misunderstood, IT topic. While security professionals agree that remediating application vulnerabilities is essential to maximizing the organization’s security posture, there is little agreement on how to effectively prioritize which vulnerabilities to remediate first. With a wide range of application security tools such as SAST, DAST, and RASP, which provide the most useful data? Security teams need to make better, faster, data-driven decisions. They are in a constant struggle to outpace their adversaries who are sophisticated and often well-funded. Jerry Gamblin has spent almost 20 years fighting cyberthreats at corporations and government agencies, and he’ll be joining us to discuss how to make the best possible decisions in managing cyber risk. Does your security team spend most of their time and energy reacting to attacks already in progress? If you’re like many security teams, the answer to that question is, sadly, yes. It’s time to approach security in a whole new way. Rather than treating the symptoms, learn to proactively remediate the root of the problem—and even get ahead by automating ahead of the threat. Join us for our next webinar, “Proactive Security Management: Stop Treating the Symptoms,” on Tuesday, October 23, 2018 at 8:00am PT. Kenna Security’s Director of Product Marketing Jeff Aboud will walk us through why and how to go beyond just reacting to cyberthreats. Get ahead of cyberthreats. Register now. To say that technology advances quickly is an understatement. With that growth has come a rapid increase in the sheer number of vulnerabilities threatening the security and well-being of organizations of every size and industry. No one is immune to cyber threats, but when you lack the context required to prioritize what to remediate first, and it's impossible to remediate every single vulnerability, how do you even know where to start? It’s time to get ahead of the cyber curve. Welcome to the next generation of vulnerability management. Register now. Finding and prioritizing application vulnerabilities is an extremely time-consuming, manual process, and it’s one that is rarely undertaken comprehensively. It’s not that application security teams don’t know where risk lies—they do. Many simply lack the time, resources, or context to address those which pose the greatest risk. The result? Oftentimes, the wrong vulnerabilities are fixed while the more dangerous ones are left unaddressed, forcing your team into reaction mode after the damage is already done. Join us for our next webinar: “Stop Playing Catch-Up on Risk: How To Prioritize Application Vulnerabilities,” powered by the Kenna Application Risk Module. Enable security and DevOps teams, developers, and executives to team up to proactively remediate application risk. Join us and see the Kenna Security Application Risk Module in action to learn how you can take a risk-based approach to application security. With an average of 40 new vulnerabilities emerging every single day, to say that staying ahead of the latest threats is a challenge is an understatement. Today, organizations are generating an unprecedented amount of data, and with that data, comes thousands, if not millions, of vulnerabilities. Unfortunately, it’s simply impossible for any organization to remediate every single one and ensure 100% coverage of its attack surface. But that’s where the capability to predict exploits comes into play.. Deliver efficiency in your people, tools, time, and dollars to address the threats that pose the greatest risk. Register now. Cyber risk management is no easy task. Why? Because while security teams may know about these vulnerabilities, they often lack the right amount of context to determine which vulnerabilities pose the greatest risk to the organization. Without this, the security team can’t appropriately prioritize which vulnerabilities should be remediated first. Join Kenna Security for our next webinar - “Close the Gaps: Managing, Prioritizing, and Addressing Cyber Risk in Enterprise Organizations,” with Jon Oltsik, senior principal analyst at ESG and Karim Toubba, CEO of Kenna Security. Discover the next wave of risk-based reporting and gain operational efficiency to maximize return on your risk mitigation efforts. There’s a difference between threat data and threat intelligence, and while the former may give you a better understanding of malicious data sources, IPs, websites, and domains, what it fails to do is give you and your security team the context to remediate a threat. When CVEs are responsible for tens of millions of attacks, simply having threat data won’t cut it. When it comes to cybersecurity, knowledge is power. And as cyber criminals gain more sophisticated tactics, protecting yourself requires a more intelligent approach. Join Kenna Security for a discussion on how cybersecurity executives can benefit from taking a risk-based approach to application security – from aligning your teams around common goals to reduce the most risk, to metrics-based reporting to the board. Joe Silva, Vice President of Cybersecurity for TransUnion will provide real-world examples to explain how to overcome the unique challenges to application security to help you gain control over your application risk posture. Joe encounters the same challenges that plague you – application security testing data with limited coverage of the application attack surface or riddled with false positives; manual application analysis that simply can’t scale; and security teams that know there is risk, but simply don’t have the time, expertise, or context to find and remediate the relatively small percentage that are high-risk. He also understands what it’s like to have a security team that must convince developers to deviate from their primary responsibility to remediate the vulnerabilities. Reporting your organization's risk posture to the board shouldn't be a scary annual or quarterly monologue, where you're on the hot seat; instead, it should be an ongoing opportunity for bilateral communication that helps drive your security strategy. Fully understanding their perspectives, priorities, and biases paves the way for valuable partnership between security executives and members of the board. - Manage crisis communication and how to avoid going "end-of-the-world"
Are you implementing Qualys, Rapid7, Nessus, or another network scanner and still struggling to prioritize your most critical vulnerabilities? Are you searching for a simple, single view of your organization's exposure to risk that you can share across security and IT ops teams and up to the CISO and the Board of Directors? Join Security Engineer, Brian Orr and Security Consultant, Gabe Howden as they take you through the Kenna Security Platform and our risk-based approach so you can learn how to take control and reduce your risk. Do you think security is overdue for actionable forecasts rather than security dogma? Are you a security leader tired of worrying about the next vulnerability with a logo and a web site? If we can forecast the weather, we can use similar models to foresee which vulnerabilities attackers are likely to weaponize. Join Kenna Security's Michael Roytman, Chief Data Scientist and Ed Bellis, CTO, Co-Founder and ex-CISO at Orbitz for a live webinar where they will debut Kenna Security's new Exploit Prediction, the industry's first vulnerability exploit prediction capability, a significant breakthrough for security professionals looking to develop a more mature proactive approach to vulnerability management. When GDPR comes into force in May 2018, many more breaches will become public knowledge, creating more work for already over-stretched security professionals. With each new breach, stakeholders will turn to their CISOs and security teams to ask to what degree their own business is at risk and to see evidence of how that risk is calculated. In this session, former Orbitz CISO & co-founder of Kenna Security, Ed Bellis, demonstrates how the utilization of AI is helping security teams to move from a reactive approach to managing vulnerabilities to a predictive, risk-based model that can rapidly scale across millions of assets. - How accurately predicting and reporting on risk measurably improves an organisation’s security posture. - How to dramatically reduce remediation time by prioritizing the most important fixes, based on real-world dynamic threat intelligence - 24 hours a day, 7 days a week. - How to align security, IT operations, and compliance with a single view of risk. Kenna is a pioneer and leader of a new category of IT security solutions that allows security and IT teams to efficiently focus on the vulnerabilities posing the greatest risk to their IT environments. We’ve experienced firsthand just how frustrating and challenging security can be – the struggles with being unable to keep up with the volume of scan data, having to settle for inadequate security due to budget constraints, picking a remediation list at random (and hoping for the best), and being unable to measure and report on your team's efforts to reduce your exposure to risk.